Some time ago, I make this spreadsheet  with the results of my test with XO 1.0 on Sugar 0.94.1Now, I'm making a new version  of the Sugar Test with the test results on Sugar 0.96.1 (Build 12.1-os11:  21011o0)The list of activities it's based on . And the time goes by.. and the activities are updated.. 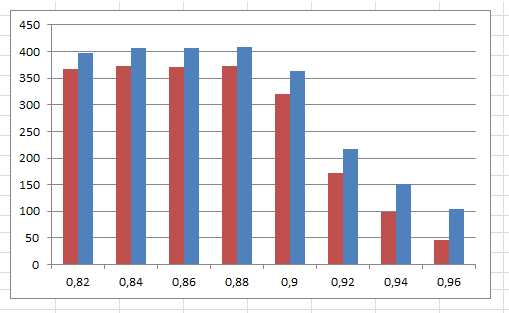 I attach 2 graphs: the first, with the comparative of the activities for each sugar version (0.82, 0.84, ..., 0.96)with 2 colors: the red bars are of january, the blue bars, of today. 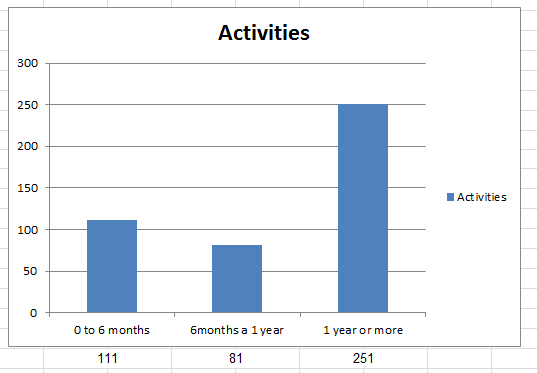 The second picture, is of the time of the activities since the latest update:     111 activities have 6 months or less    81 activities between 6 months - 1 year    251 activities! more than 1 year.. and counting..